Make the most of everything that the Kowhai Coast, Matakana and Mahurangi area has to offer. The Rodney district boasts some of the finest regional parks, recreational areas and marine reserves in New Zealand, and they are all easily accessible from Martins Bay. 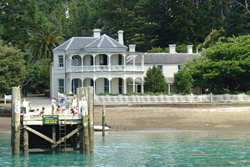 Just a few minutes from Martins Bay, take a ferry from Sandspit to historic Kawau Island and visit the former Mansion House island residence of Governor Grey. Visit Tiritiri Matangi, a unique island bird sanctuary that hosts some of the world’s rarest bird species. 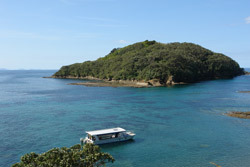 For diving and snorkelling go to Goat Island marine reserve. Immerse yourself in the undersea world, or enjoy a tour on the glass-bottom boat. For surfing, visit the beaches at Omaha, Tawharanui, Leigh and Pakiri. For golf, there are excellent courses at Warkworth and Omaha, and there is a golf driving range on the road to Warkworth that also has cricket and softball bowling and pitching machines. If you enjoy walking there are walking tracks that cover all kinds of terrain around the coastline, through native bush and forest, across farmland and along beaches. Explore local Regional Parks – Scandrett (only half an hour’s walk from the lodge), Tawharanui, Mahurangi, and other local walking trails.